While spinning your wheels is mostly a bad thing, one event turned it into a positive. On Saturday, March 5, Windsor Spinergize held its fourth annual spinathon benefiting The Hospice Of Windsor & Essex County. Hosted at St. Clair Centre For The Arts from 8 a.m.-1 p.m., 170 people turned out and many were determined to go the distance. With stationary bikes donated by local fitness clubs, those attending took part in 50 minute sessions while viewing the Detroit skyline from the second floor of the building. Overseen by fitness instructors and a DJ pumping out the tunes, the $2,000 machines made it easy to get a good workout. 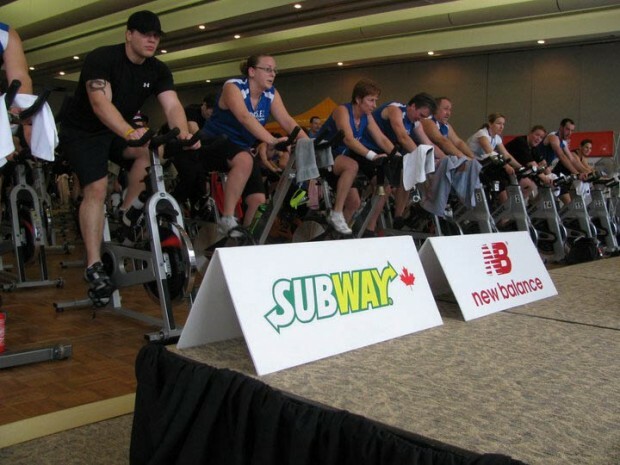 Some cyclists continued for all five hours but $100 in pledges was needed before registering. Within 60 minutes, participants drummed up $15,000. By the time prizes were awarded and all was said and done, $35,000 was raised for The Hospice – money that goes a long way. The Hospice is the largest hospice in Canada and provides programs and services for those fighting life-threatening illnesses. Their full range of services include counseling, Therapeutic Touch and Radiant Touch, support groups, transportation, education, home visits and Art Therapy. Vincent praised those who participated in the spinathon and feels money raised will help Windsorites.